Closing a sale using an Alternative Close is old fashioned, out of date, and most buyers are aware of the technique. But read this page and see how you can develop the technique into a modern, effective way to help you to increase sales or grow your business. The original Alternative closing technique was to offer a prospect a choice of usually two alternatives and when they make their selection the sales person assumes, or pretends to assume, that the prospect wishes to purchase the one selected. Seller: Which would you prefer, Red or Blue? Prospect: The red one looks best. Seller: Good choice, I’ll wrap it for you. The alternative question asked which one the prospect preferred, not which one they want to buy. Once a choice is made the seller makes an assumption that they can now close the sale. If I was asked if I prefer a private jet or a personal helicopter I would answer the jet, but that doesn’t mean I will be buying one anytime soon. Used in this way the alternative close always makes me think of a fast talking street trader selling out of a suitcase, or a stall holder on a tourist market. The slightest sign of agreement and with lightening speed the seller is closing the sale and the item is wrapped and pushed into the prospects hand making it difficult for them to back out. Closing a sale with this technique in its original format is still used in quick one off sales where the seller is not looking for repeat business or referrals. But most prospects are informed and aware of such linguistic tricks nowadays and these manipulation techniques just don't work anymore. The good news is: With a few changes, adaptations, and development, the alternative closing technique can be used for closing a sale in a modern professional sales setting with B2B and Direct Sales prospects. Now let’s take this old fashioned trick for closing a sale and develop it into a modern technique that will work ethically with all prospects. What makes the original technique so dated is the way sellers would use the prospect’s preference for one of the alternatives offered as a buying signal. So to develop this technique let’s not use the alternatives as a way of closing the sale. Instead we will build it into our Sales Presentation stage of the sale and use it to gain agreement. This will work in two ways, it will help us to pin point the sales offer that the prospect is interested in, and gain agreement from them. The more agreement you gain throughout your sales pitch the easier it will be when you are closing a sale. Well we can’t call it an alternative close anymore can we because we are not using it to close a sale, we’re using it to gain agreement. ..We can use this alternative presentation technique to gain agreement to one of two alternative sales offers that we present to the prospect. The alternatives can be totally separate sales offers or two variations of the same offer. For example: In car sales you could be offering two completely different cars that both meet the prospects needs. Or, you could be presenting just the one car but with two different ways of purchasing it, such as cash or credit agreement. When you gain agreement in your presentation you are another step closer to closing a sale. Each time you gain agreement in your sales presentation it is like a mini-close. As you build up all these mini-closes you are securing the sale because the prospect is saying yes to the individual elements of the item or service you are selling. By building all this agreement into your sales presentation you will make it harder for them to say no or raise a sales objection when you ask the final question to close the sale. The Alternative Presentation Technique can also be viewed as a trial close, a way of testing the prospect’s commitment and seeing if any objections come up before you ask for the order. How do you close a sale. How do you ask for the order or ask the if prospect is ready to buy. For many sales people this is an area that they would like to improve, and for good reason. I manage and train teams of sales people and they all need to be expert closers, they need to know how to ask for the sale. Showing them how to do that is my job. 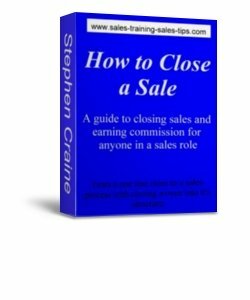 I’ve put together my ideas on closing a sale in an eBook training course. It has 40 concise pages so you can put it into action the same day. The course shows you how I train my sales teams to close sales and we’ve had some really good improvements in results with this course.